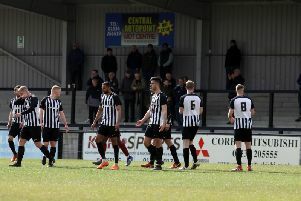 Corby Town have clinched the signing of Leamington captain Stephan Morley. The 26-year-old left-back made over 200 appearances for the Vanarama Conference North side but has now joined the Steelmen for what is his second stint with the club. Morley had a loan spell with Corby from Kettering Town during the 2006-07 season and has also played for Banbury United, Hinckley United and Rugby Town in the past. It is a key signing for boss Tommy Wright as the Steelmen bidsfor promotion from the Evo-Stik Southern League Premier Division this season. Wright said: “Myself and Dave (assistant-manager Clarke) have worked tirelessly to identify a left-back who will give us both the balance and experience we need for the final push. “Steph fits that mould perfectly for us. He has a great left foot and will give quality supply to our front men via crosses and also improve our delivery from set plays. Leamington manager Paul Holleran believes the offer of coaching role within the Corby academy set-up was the key factor in Morley leaving. Holleran said: “I am extremely disappointed to lose Stephan. “He has been a big part of what has been achieved at the club and has been loyal to us in the past, despite a number of approaches that would have benefited him financially. “I had hoped that his talks with Corby would come to nothing and if it had been purely about football, I believe we would have retained him. “This is a career decision on his part where he is placing his job before football. He wants a career within football coaching and he believes this is too good an opportunity to miss. “Stephan has been a great servant with over 200 appearances for the club, scoring some wonderful goals and steadfast performances in defence for us. As reported in this week’s Corby Telegraph, the Steelmen have also confirmed that defender Jamie Anton has joined Holbeach United on a month’s loan.